Veteran shorecaster Kahana Itozaki landed this 101.2-lb ulua using a 121/2-foot Talon pole, Newell G454 reel and a combination of Ande 60-lb test and Maxima 80-lb test line. He hooked the monster while fishing in the Kau District of the Big Island. 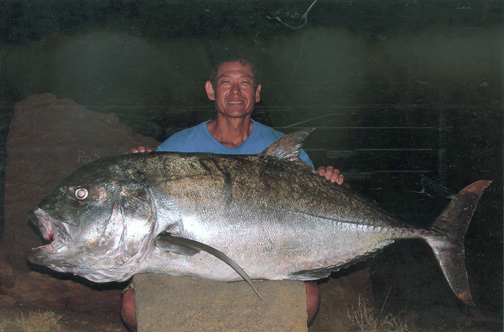 This is Kahana's fourth 100-plus-lb giant trevally.